Recently, I was directed to a new MATLAB software package that compares pixel movement between two images taken at different times. 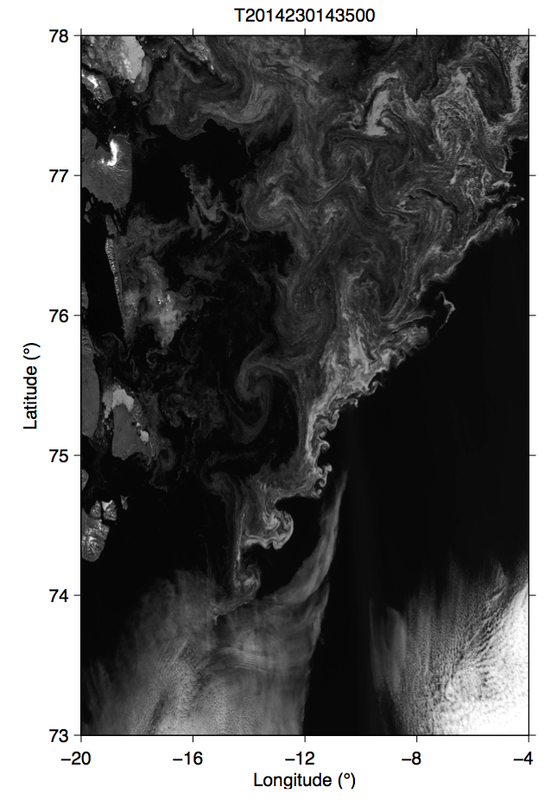 I applied this software to satellite imagery of the NE Greenland coastal shelf to identify surface currents from moving ice. Two of the images above were taken by MODIS on August 18th (Left) and August 19th (Right), 2014. 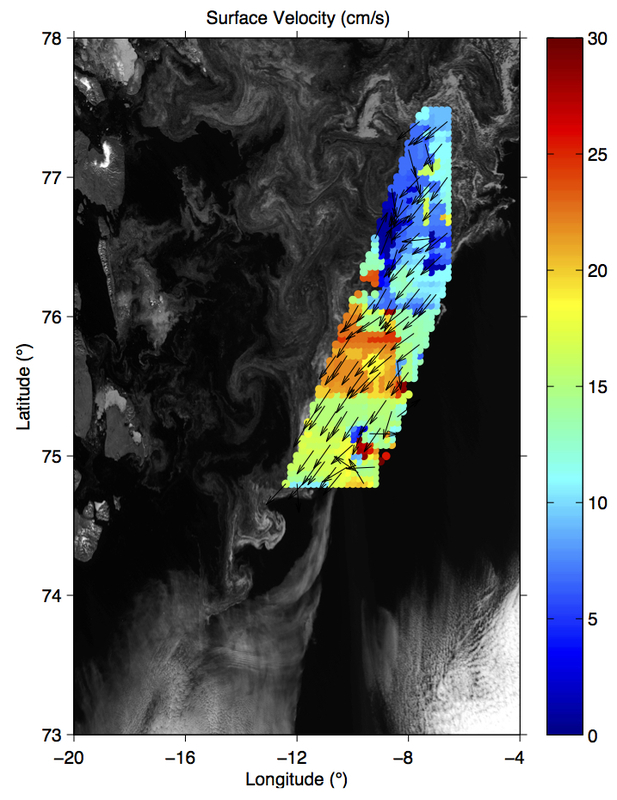 The images show the surface of the coastal ocean near NE Greenland; white dots are pieces of ice. The highlighted region in the middle figure shows a velocity field derived from these two days indicating ice motion towards the South. Listed below is a larger version of the middle figure. What does this mean? 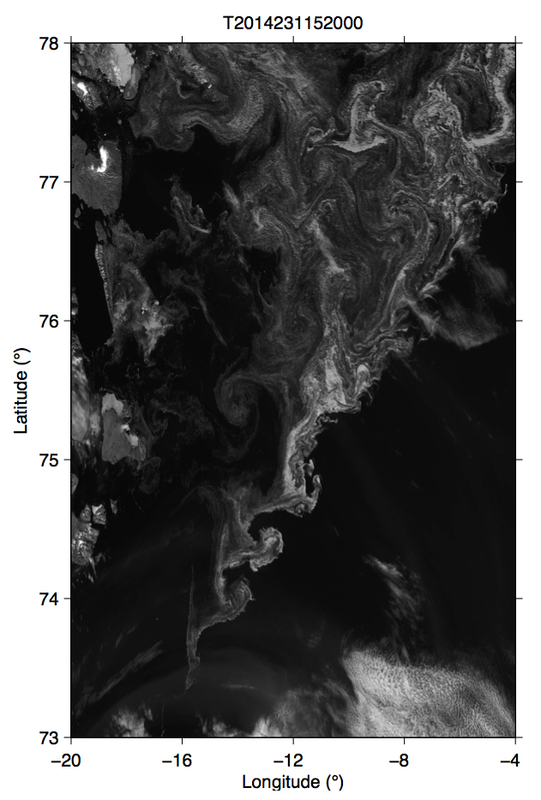 Well, based on the work of Falck (2001), this water is on its way from the Arctic Ocean. The surface water is relatively fresh, and as we move from fall to winter this water will cool and new ice will form quickly. Notice that the waters to right in the images are largely clear of ice and that it is this southward current that keeps the ice in a banded structure. This is not something the new iPhone 6 will help me with, but some of the software in the iPhone camera could prove helpful, as I may just have learned in a seminar on bubbles of air bursting from breaking waves. This entry was posted in Greenland, Oceanography and tagged Arctic Ocean, continental shelves, currents. Bookmark the permalink. What matlab software package? very cool.Also would a PIV software package work with the bits of ice as the particles? or has the already been done ( I have no idea)? The package is called ImGRAFT and it was originally created for tracking glacier movement (link: http://imgraft.glaciology.net/). The specific function is called template matching. I haven’t ever used PIV software, but after a short read it seems like its similar to this ImGRAFT software package.